I have guided Laurie and Ian before on the Bristol Avon for chub but this time they wanted to fish the river Wye for barbel. 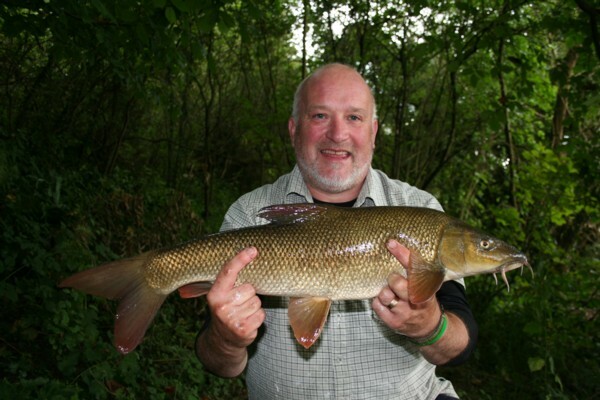 As most of you know it’s not a difficult river to fish once you know where to find the barbel. However when you have little free time to go fishing like Laurie and Ian have then it’s important to be on the fish. We decided to travel together to save on fuel and toll bridge costs and arrived on the stretch we were going to fish at 6.30am. At first the river looked to have some colour to it however on closer inspection it was reasonable clear. The height was just slightly up from my previous visit so things looked good. We started in a swim which does tend to produce a few fish first thing but then tails off. So the method was 12lb main line swim feeder packed with pellets and ground bait a longish 3ft braid hooklink and a size 8 hook with a 10mm pellet hair rigged. All pretty standard stuff. After about 30 minutes of casting in Ian had a take which resulted in a hook pull, so 1-0 to the barbel. We sat there for another 3 hours without a touch, which normally signals the time to move down to the wooded area. It had been a very pleasant day with some cloud but plenty of sun shine. So we packed away some of the kit in the car and headed downstream. Now the banks in the wooded section are very steep and treacherous at times particularly when wet. We arrived at the chosen swim and had two rods cast out to the far side of the river. The rods were placed in a rod pod similar to the ones used in beach fishing. The reason behind this is that it’s practically impossible to embed bank sticks in to rocky banks. Soon Laurie’s rod arched over and he was playing a good chub, which went on the scales and gave him a new pb of 4lbs 4oz. A great start in a new swim and no blanking for him. 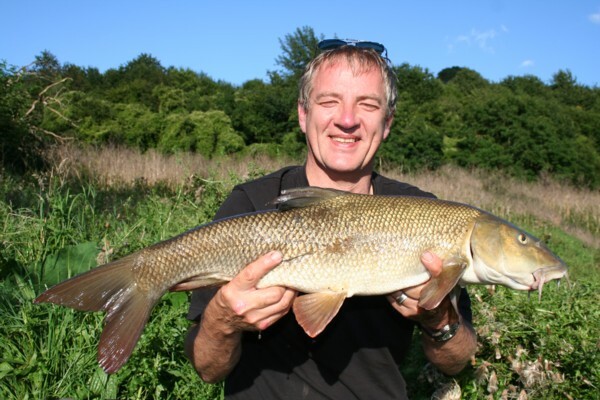 Next it was Ian’s turn to hold onto a buckling rod which signaled a barbel was on the other end. 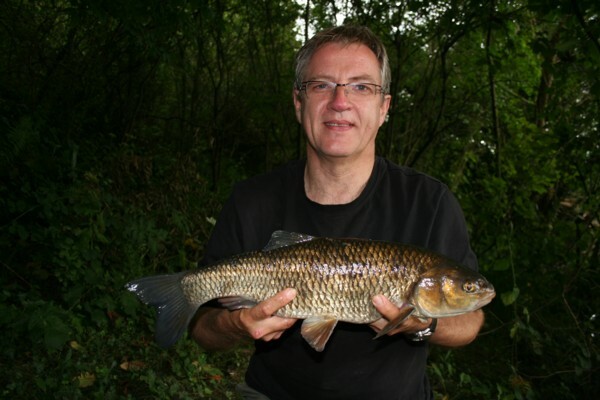 It fantastic when you hook these fish in a fast flowing river they really fight well. This fish turned out to be 6lbs 6oz. So again no blanking for him. 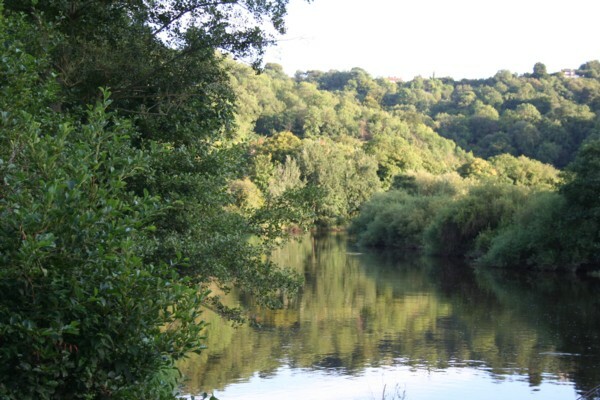 The canoes were busy paddling downstream to Symonds Yat and small floatilia’s would go through the swim. Fishing midweek like we do you tend to get families in canoes and most of the time they are very pleasant and courteous. Yes sometimes out of control and going down broadside and yes tangling with all the branches and bushes that are on the rivers edge. However most are polite. 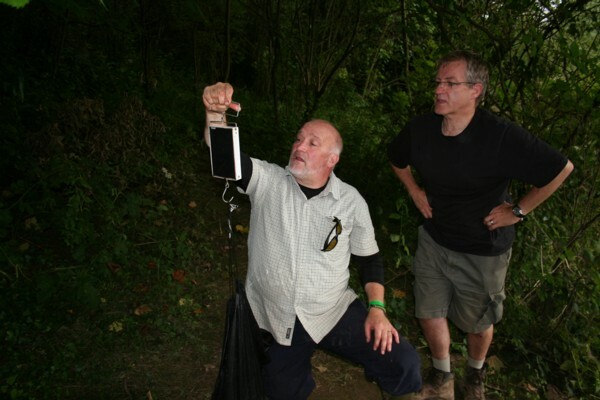 While we stood ready for action we had a few light showers and the overhead canopy of tree branches sheltered us. Every time I go to the wooded section it pours with rain, and I’m thinking of renaming it the rain forest. Laurie was the chub king and caught another good size fish of 4lbs 10oz. 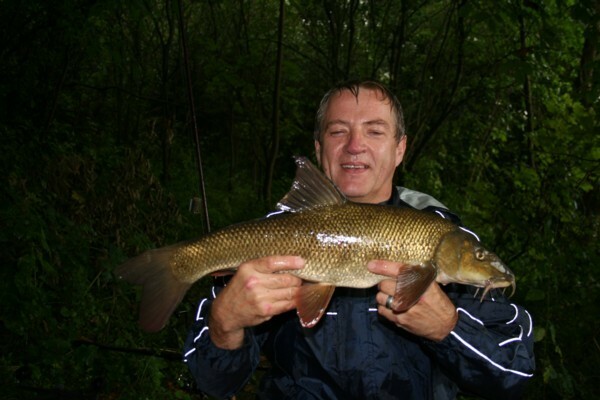 Ian was catching more barbel too. In no time at all a great big cloud came over and we had one of the heaviest showers of rain that I’ve experienced on the Wye. This made the banks treacherous to say the least. 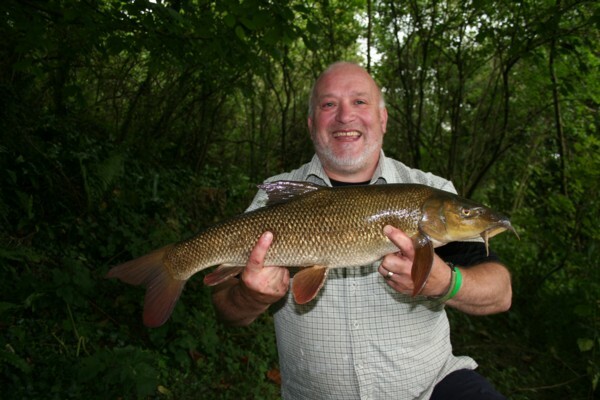 We were still catching barbel at this stage. The rod would hoop over and the call of “fish on” could be heard. 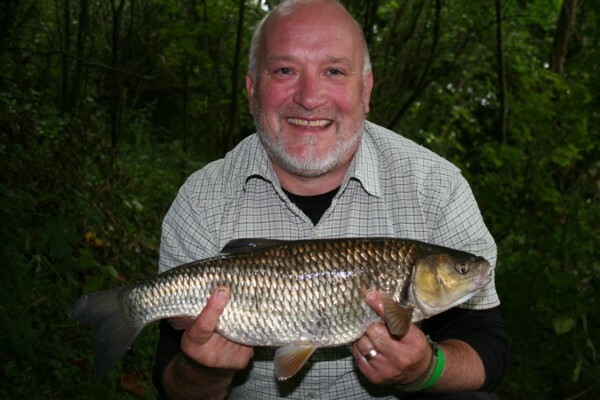 Ian was soon in on the chub act and had a lovely looking 4lber. The rain poured and poured making the swim now unfishable the mud was not allowing any foot purchase and Ian and Laurie stayed on the upper part of the bank. 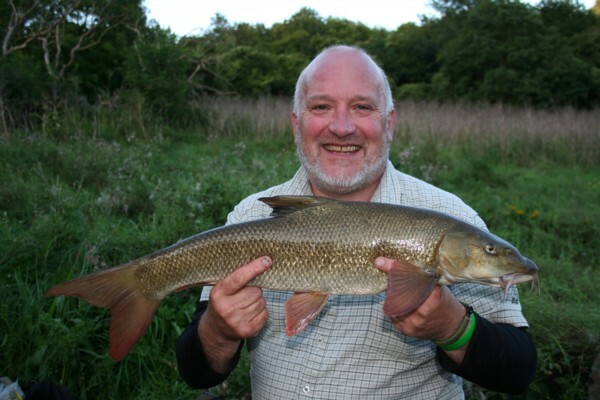 With Laurie’s rod still out it soon hooped over once again I hooked a barbel and got Laurie down to play and land it. Not a monster but at 4lbs 10oz it fought well in the current. We were dripping wet by now as the photo shows. The rain started to ease after about 40 minutes or so and we decided to return to a safer swim upstream. Time had passed quickly and it was nearing 4pm. I guess times passes quickly when you are catching fish. 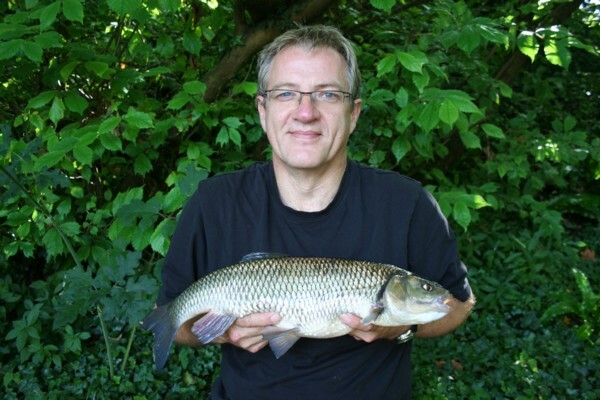 In total during 3 hours Ian and Laurie had caught, 8 barbel and 5 chub. It was with a heavy heart that we moved because I’m sure if we stayed then the sport would have continued. Ian and Laurie though were very contented. It’s a funny game because just as we exited the rain forest into the field then the sun came out. Arriving at our swim first thing was to make a cuppa. It also gave us time to dry out. After about an hour Ian had his string pulled again by a very big fish by the look of things, however things ended quickly as he didn’t have the clutch set correctly on the reel and the line went slack after a huge surge from the fish to get across the river. Laurie caught a small chub to get things going again. I managed to get hold of Dan who fished the stretch the day before to see how they did. Disappointingly they only caught 1 barbel each and a few chub, so at least we were doing a little better. The evening approached and sure enough the barbel switched on as did the sun. 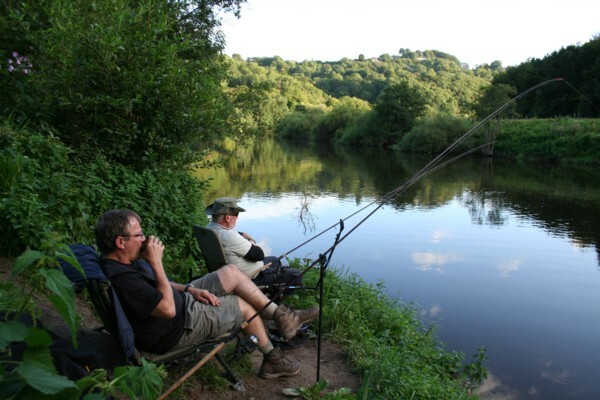 It was just beautiful lazing in the late summers sun and watching the rods hooping over and fish being landed. Nothing huge came along Laurie had the largest of the day at 7lbs 6oz. Ian had a couple more to add to his tally however they were only small 5lbers. Still at 8.15pm the boy’s were more than happy to call it a day. They had probably had about the best days fishing they had ever had. For me it could have been better had we landed the couple of larger fish that were lost. Hopefully lessons have been learnt to avoid this happening again. I think we did reasonably well given that others had clearly been struggling. 11 barbel and 6 chub wasn’t that bad. So a wonderful days fishing with two great anglers and friends. This entry was posted on Friday, August 24th, 2012 at 11:37 am	and is filed under Uncategorized. You can follow any responses to this entry through the RSS 2.0 feed. Both comments and pings are currently closed.